The number of dead or missing in China from Typhoon Kaemi approached 100, as gales and rains continued to batter the nation's densely populated eastern and central provinces, Xinhua News Agency said. The official death toll from Kaemi, which hit China's southeast coast Tuesday night before being downgraded to a tropical storm, has risen to 32, while at least 65 are missing, the Xinhua reported. Kaemi, meaning "ant" in Korean, is the fifth typhoon to hit China this year and has caused scenes of misery and devastation as it has struck rural communities ill prepared for the relentless bad weather. State television showed footage of farmers fleeing their flooded homes, one of them carrying a tiny and fragile-looking old woman huddled into a basket. The storms have gradually moved northwards, leaving a trail of destruction from Fujian province in the southeast to Anhui province in the nation's rural heartland, forcing the evacuation of more than one million people. While this typhoon appears to be less lethal than its immediate precursor, Bilis, which struck a fortnight ago and cost more than 600 lives, it could deal a devastating economic blow to areas along its path. In Anhui, which was feeling the full force of the storm on Friday, 21,000 hectares (52,000 acres) of farmland had been damaged or otherwise impacted, while 2,695 houses had collapsed. It has triggered landslides along a key highway linking Beijing with Guangdong, south China's manufacturing center, interrupting one of the country's most essential transport arteries, according to Xinhua. And in the central province of Hubei alone, it had forced 25 industrial enterprises and mines to cease operations temporarily. 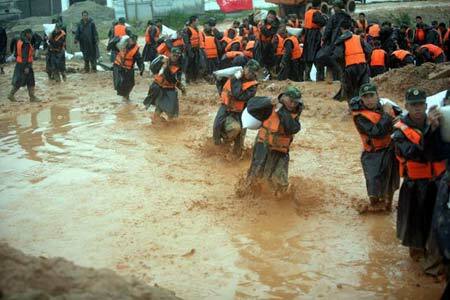 Earlier, Kaemi also swept away an entire barracks in Jiangxi, with six people killed and another 38 soldiers and relatives missing, the agency reported. Southern and central China has suffered two months of brutal weather, with authorities reporting over the weekend before Kaemi struck that more than 1,300 people had died from weather-related disasters since May. "Since most of this year's typhoons have penetrated all the way into the interior, the impact has been comparatively serious," Xinhua said. Vice Premier Hui Liangyu on Thursday called for more precise weather forecasts and early warnings to reduce the impact of disasters, Xinhua said. The unusual patterns observed this year have underlined the need for precise observations. China's typhoon season normally occurs in August and September. But Typhoon Chanchu, the first of the season this year, hit in mid-May. More typhoons or tropical rainstorms are expected to hit China this year, partly due to the warm ocean current in the northwestern Pacific and high temperatures in the Qinghai-Tibet Plateau, meteorologists have warned.